Sometimes the best trips aren’t really trips at all but outings or short getaways. These are not ment to be confused with what is commonly referred to as "stay-cations”. Call it what you like but for me the term “stay-cation” just makes me irritable. What brainiac came up with that term and who do they think they’re fooling? It is hardly likely that you could ignore the trash, skip the laundry and refuse to cook. You're more likely to spend the week wishing someone would knock on your door and whisper, "Room service" or "housekeeping". Where was I going with this? Oh yeah, outings! I had had two weeks of torment so I was due for a break. First I’ve been going through my mother’s things for what seems like forever and then seems too soon. I finally got the bulk of it done and sent the legal documents off to my brother the executor. WHAT A RELIEF! Then I had to go to court for the second time to testify against the driver that totaled our van and injured my little girl. The first time (two hours of sitting) he was a no show. Maybe he was on a stay-cation! (Picture me very irritable) This time I was determined to put him away! O.K., maybe I was a little more than irritated. Seriously though, I did not want him to get off. He didn’t show again but he was represented. Call me crazy but I found it a little surreal that I was going before a Judge while standing next to P.T. Barnum (the officer from the scene) and Carnie (the defendant’s lawyer). “All Rise, . . . for the greatest show on earth! Yes, Your Honor, I witnessed the whole incident. It was the bearded lady and the lion trainer behind the funhouse.” That’s when I knew I needed a break! No, I did not make any wisecracks but I did have to suppress a crackup. So we decided to go on an outing. One of the best thing about outings is they often don’t require much preparation. In spite of 15-knot winds (I should have been sailing) I really enjoyed the day. We brought along one of our daughter’s friends whom I would adopt if it weren’t for her proud parents. Some days they want to give her away, but most not! We looked at sand sculptures and the girls went swimming. A little sun and sand was just what we needed and as you can see the sculptures were amazing! The American Sandsculpting Championship and Beach Festival is held every fall on Ft Myers Beach just behind the Fort Myers Beach Holiday Inn. It is well worth the trip. No reservations required — just a little traffic, an entry ($10 per family) and a parking fee ($5 — $10). The photographs are from last year's and this year's event. Check out their website to see the winners and more great photographs. Another outing I remember fondly was a few months ago. I called some friends to see if by some miracle one or two of them were free to meet up while we were in Fort Lauderdale. Most of our oldest and dearest friends live in SE Florida and like everyone we don't communicate nearly enough. Surprisingly, almost everyone I called was free! So I searched the web for a place that might be centrally located, suite everyone’s palate and would allow us to linger. Through Urban Spoon and Open Table I managed to find and book a great restaurant, Galanga Thai Kitchen & Sushi Bar. Both Urban Spoon and Open Table are available as Iphone Apps or online (links above). Urban Spoon helps you find and review restaurants easily. What I like best about it is the ability to lock in area, type of food and/or price to narrow down your search with a really cool widget. Open Table, as far as I know, is the only real-time online reservation network. Honestly, I haven’t really looked further because I like it so much. Open Table checks for availability, books your table then emails you the reservation. They even called to see if we were running late when the new hostess didn’t realize we’d been seated much earlier. Pretty cool! I definitely recommend checking both websites out and Galanga Restaurant. The food was great! Our evening was filled with much wine, much food and much frivolity. It’s often our tendency to say that we'll never get everyone together; everyone’s too busy, but I have to tell you I can’t remember the last time I had so much fun! I can’t remember what the bill was either, thank God! After five hours of food and drink I would have had to blight that bill from my memory anyway. We absolutely should do this more often. So should everyone. Even if you are hit with the ‘I really need to clean the garage this weekend’ excuse push a little harder. It’ll be worth it! I’ve said all this because most of us work really hard and before we know it the weeks, months, even years have passed and we haven’t done anything for ourselves. What is it all for if we don’t get to spend some of it taking a well-earned break? Have you checked your irritability meter lately? Of course mine is set a little high (no comments on that please). In this depressing economy we can’t afford not to do something uplifting and if you can’t take a week long vacation go on an outing. Think about all the things you haven’t checked out in your local area. 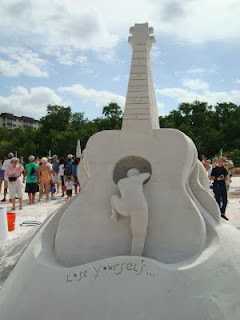 If you really can’t go anywhere right now just turn off the phones, push the furniture back, crank up the music and as the sand sculptor says, "Lose Yourself. . ."
I have to say laurie can definetly come up with some great outings. Looking great! Love how you added the TravelVision logo.